First docking with the ISS. Transferred equipment from the Spacehab Logistics Double Module to the interior of the station. AKA: Discovery;ISS-2A.1;Spacehab Logistics Double Module. Launched: 1999-05-27. Returned: 1999-06-06. Number crew: 7 . Duration: 9.80 days. May 27, 1999, 6:49:42 a.m. EDT. The originally scheduled launch of Discovery on May 20 was postponed because of hail damage sustained May 8 by the external tank while on the pad. It was determined that some of the tank's foam insulation could not be reached for repairs with the orbiter on the pad. The orbiter was returned to the VAB, and inspections revealed more than 650 divots in the tank's outer foam. Workers repaired about 460 critical divots over four days to minimize ice formation prior to launch. The countdown proceeded smoothly, with the only concern the presence of a sailboat in the solid rocket booster recovery area. As planned, launch managers determined the exact orbital location of the International Space Station during the countdown's T-9-minute built-in hold. The decision was then made to launch Discovery at 6:49 a.m. EDT to achieve optimum Shuttle system performance and to accommodate Shuttle-Space Station docking activities. June 6, 1999, 2:02:43 a.m. EDT. Runway 15, Kennedy Space Center, Fla. Rollout distance: 8,866 feet. Rollout time: 56 seconds. Mission duration: nine days, 19 hours, 13 minutes, 57 seconds. Landed on orbit 154. Logged 3.8 million statute miles. Landed on first opportunity at KSC, marking 18th consecutive landing in Florida and 25th in the last 26 missions. All major objectives were accomplished during the mission. 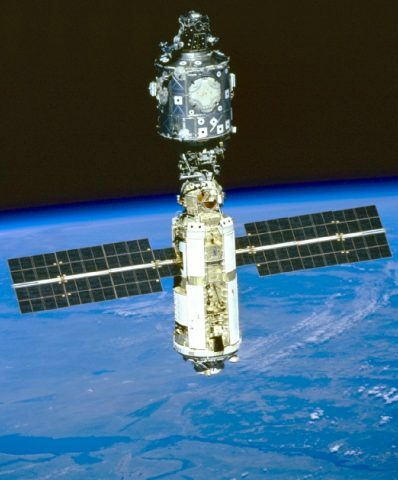 On May 29, Discovery made the first docking to the International Space Station (ISS). Rominger eased the Shuttle to a textbook linkup with Unity's Pressurized Mating Adapter #2 as the orbiter and the ISS flew over the Russian-Kazakh border. The 45th space walk in Space Shuttle history and the fourth of the ISS era lasted 7 hours and 55 minutes, making it the second longest ever conducted. Jernigan and Barry transferred a U.S.-built crane called the Orbital Transfer Device, and parts of the Russian crane Strela from the Shuttle's payload bay and attached them to locations on the outside of the station. The astronauts also installed two new portable foot restraints that will fit both American and Russian space boots, and attached three bags filled with tools and handrails that will be used during future assembly operations. The cranes and tools fastened to the outside of the Station totaled 662 pounds. Once those primary tasks were accomplished, Jernigan and Barry installed an insulating cover on a trunnion pin on the Unity module, documented painted surfaces on both the Unity and Zarya modules, and inspected one of two Early Communications System (E-Com) antennas on the Unity. During the incursion inside the ISS, Barry and Husband replaced a power distribution unit and transceiver for E-Com in the Unity module, restoring that system to its full capability. Payette and Tokarev replaced 18 battery recharge controllers in the Russianbuilt Zarya module, and Barry and Tokarev also installed a series of "mufflers" over fans inside Zarya to reduce noise levels in that module. The mufflers caused some air circulating duct work to collapse, and Rominger sent down a video inspection of the mufflers. The crew transferred 3,567 pounds of material � including clothing, sleeping bags, spare parts, medical equipment, supplies, hardware and about 84 gallons of water � to the interior of the station. The astronauts also installed parts of a wireless strain gauge system that will help engineers track the effects of adding modules to the Station throughout its assembly, cleaning filters and checking smoke detectors. Eighteen items weighing 197 pounds were moved from the Station to Discovery for a return to Earth. The astronauts spent a total of 79 hours, 30 minutes inside the Station before closing the final hatch on the orbiting outpost. Rominger and Husband commanded a series of 17 pulses of Discovery's reaction control system jets to boost the Station to an orbit of approximately 246 by 241 statute miles. After spending 5 days, 18 hours and 17 minutes linked to the Station, Discovery undocked at 6:39 p.m. EDT as Husband fired Discovery's jets to move to a distance of about 400 feet for 2 _ lap fly-around. The crew used the fly-around to make a detailed photographic record of the ISS. After the fly-around, mission specialist Payette deployed the STARSHINE satellite from the orbiter's cargo bay. The spherical, reflective object entered an orbit two miles below Discovery. The small probe became instantly visible from Earth as part of a project allowing more than 25,000 students from 18 countries to track its progress. Other payloads included the Shuttle Vibration Forces experiment and the Integrated Vehicle Health Monitoring HEDS Technology Demonstration. Family: Manned spaceflight. People: Barry, Husband, Jernigan, Ochoa, Payette, Rominger, Tokarev. Country: USA. Spacecraft: Discovery. Launch Sites: Cape Canaveral. Agency: NASA, NASA Houston. STS-96 - Wakeup Song: California Dreamin' - . Flight: STS-96. "California Dreamin'" - Mamas and the Papas --played for Mission Specialist Tammy Jernigan. STS-96 - Wakeup Song: Danger Zone - . Flight: STS-96. "Danger Zone" - Kenny Loggins played in honor of Commander Kent Rominger, an alumnus of the Naval Fighter Weapons School of"Top Gun" fame. STS-96 Mission Status Report # 05 - . Nation: USA. Related Persons: Barry, Jernigan, Rominger. Program: ISS. Flight: STS-96. STS-96 - Wakeup Song: Star Wars - . Flight: STS-96. "Star Wars" themes by the Space Center Intermediate Band. 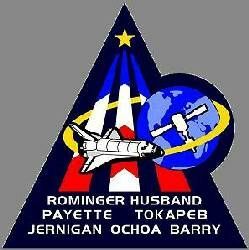 Mission Specialist Dan Barry's daughter Jenny plays flute in that band..
STS-96 - Wakeup Song: Morning Colors - . Flight: STS-96. "Morning Colors" - U.S. Coast Guard Band or"Morning Call" by USMC Band..
1999 May 30 - . 02:56 GMT - . EVA STS-96-1 - . Crew: Barry, Jernigan. EVA Duration: 0.33 days. Nation: USA. Related Persons: Barry, Jernigan. Program: ISS. Class: Manned. Type: Manned space station. Flight: STS-96. Spacecraft: ISS. On May 30 at 02:56 GMT Tammy Jernigan and Dan Barry entered the payload bay of space shuttle Discovery from the tunnel adapter hatch. During the space walk they transferred equipment to the exterior of the station..
STS-96 - Wakeup Song: Amarillo by Morning - . Flight: STS-96. "Amarillo by Morning" by George Strait. Played in honor of Pilot Rick Husband, who is from Amarillo, Texas..
STS-96 - Wakeup Song: Exultate Jubilate - . Flight: STS-96. "Exultate Jubilate" by Mozart. This is a favorite of Canadian Space Agency astronaut Julie Payette..
STS-96 - Wakeup Song: Vasha Blagarodye - . Flight: STS-96. "Vasha Blagarodye" , a Russian song, followed by"The Charleston". Played for cosmonaut Valery Tokarev and Mission Specialist Ellen Ochoa..
1999 June 3 - . STS-96 - Wakeup Song: Free Bird - . Flight: STS-96. "Free Bird" by Lynyrd Skynyrd in anticipation of the Discovery's departure from the ISS..
STS-96 - Wakeup Song: Good Morning Starshine - . Flight: STS-96. "Good Morning Starshine" in recognition of the deployment of the Starshine satellite..
STS-96 Mission Status Report #19 - . Nation: USA. Related Persons: Rominger. Program: ISS. Flight: STS-96. STS-96 - Wakeup Song: The Longest Day - . Flight: STS-96. "The Longest Day" - Theme from the movie to commemorate what spacecraft communicator in Mission Control Mario Runco called a"landing of a different kind" referring to D-Day on June 6, 1944..